I had a very interesting conversation recently with Aoife who talked a little about her passions and struggles after the birth of her second child. She kindly put some thoughts in writing and I thought they were worth sharing. ‘I am on a quest to shine a light on maternal physical and mental health. Although not an expert in either department, being a mother to two small (beautiful) children has given me an education in both. Physically I gained a bellyful – and bumful – of excess weight during my second pregnancy due to comfort-eating and a very unhealthy relationship with sugary treats. As a result any type of physical activity became an enormous struggle. Being deprived of my normal healthy routine also negatively impacted on my mood, energy levels and general ability to cope with every day demands. The synergistic effect of the assault on my mind and body throughout pregnancy and beyond left me anxious, feeling blue, isolated and overwhelmed. As my children – and struggles – grew I began to realise that mothers don’t talk about their own battles, anxieties, sleepless nights or feeding woes. Was I the only one? We should be all part of the same club, able to share in our triumphs and failures equally. But no, there’s a real fear amongst us to admit to any of these things. Maybe by admitting to a failure of our ability to cope we would in some way be saying that we have failed as women and as mothers. We also fear judgement. To confess to our weaknesses and humanity ought to be a cathartic experience, but we sit silent, complicit in the lie that everything is okay. The first step in my journey to a happier body and mind was exercise. I knew the benefits of keeping fit before I got pregnant, but what I didn’t know was how to combine the timetable of a baby with regular exercise. Prioritising our needs usually is bottom of the list under children, work and maintaining the house. Let’s be honest even thinking about it is exhausting! Finally it dawned on me that walking with my baby in our buggy was my only option to factor in some physical activity. This was a life-changing moment. By motivating myself to leave the house for a walk I became lighter. The four walls of our homes can protect but they can also imprison. By getting outside and freeing my legs, body, mind and soul on a walk the clouds of stress and anxiety dissipated and burned, along with the fat. This new found love for walking with baby soon became a passion for exploring walks that were accessible to buggies. This became a shared experience as I invited friends, and their babies, along for a wheeled walk. As we pushed our buggies alongside each other we talked more freely about our daily struggles and shed our fears easier than if sitting opposite each other over a coffee. The highs and lows of parenting ebb and flow like the tide. On the high tide we’re lifted on the joy and magic of it all, but when the water rushes out it can expose our buried fears and anxieties. We need not fight the swell or row against it alone. While post natal depression is a serious medical condition and doesn’t affect all mothers my guess is that most new mothers have dealt with some of the issues mentioned above. Together we can try to end the stigma of maternal mental health and open up about how tough mothering is. By walking, and talking together we can lighten the load. Aoife’s account highlights the research link between exercise and lifting mild to moderate depression. When it comes to Post Natal Depression then an assessment by your GP is necessary. In addition the benefits of depression include reducing stress, anxiety, boosting self-esteem and improving sleep – albeit disturbed by young children. 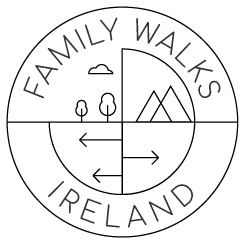 Finally, I think Aoife has hit the nail on the head in terms of integrating her walk/talk to her daily routine. From my work on Operation Transformation I have found that those leaders who see their food/exercise plan as an ‘additional’ thing to do they struggle, compared to those who integrate these tasks into their daily plan. Celebrity Operation Transformation is about to kick off I think this will be hard for some of our celebrities one of whom eats out 21 times per week! 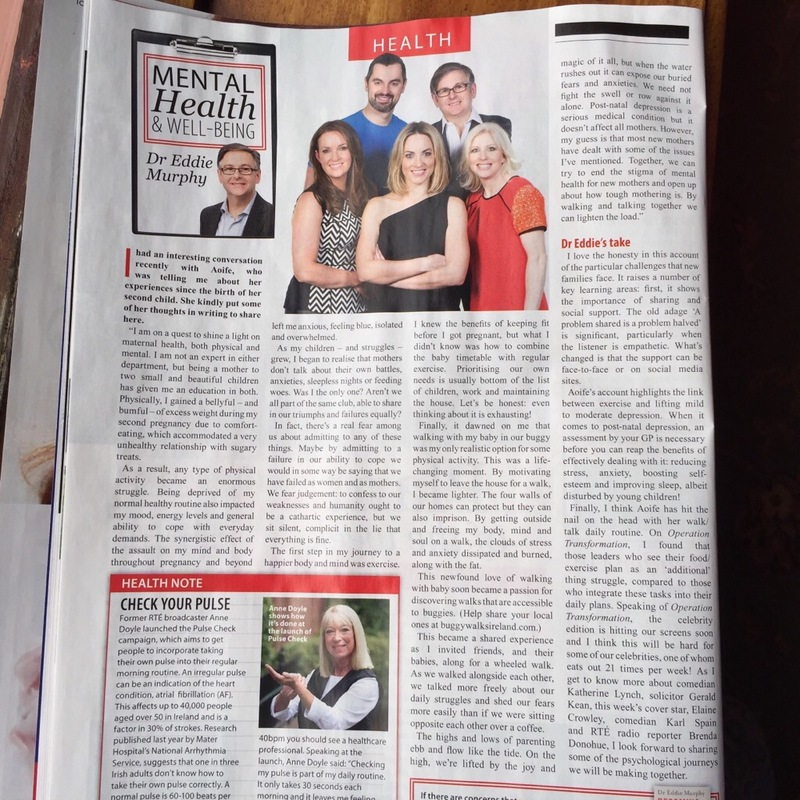 As I get to know more about our Famous Five – comedian Katherine Lynch; solicitor Gerald Keane; TV3’s Midday presenter, Elaine Crowley; comedian Karl Spain; and RTÉ radio reporter Brenda Donohue I look forward to sharing some of the psychological journey that we will be doing together.